Ok, friends, here it is! Ever since I put a strip of these cute floating triangles on the back of my Tilt-A-Whirl quilt back in November, I’ve been flooded with requests to share how I did it. 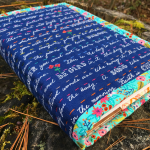 Well, I stitched up a fun pillow this week for my modern guild Madrona Road Challenge swap partner, which gave me the perfect opportunity to put together a little tutorial for you all. 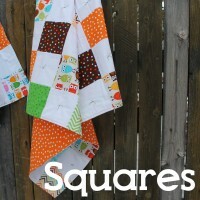 This fun block is really improvisational, and a fantastic way to use up those itty bitty triangle scraps. To make them “float”, each triangle is framed with background fabric and then trimmed down at a wonky angle to create a 4.5″ square unit. These units are the building blocks to whatever you want to make. In this 16.5″ pillow, I used 16 units. 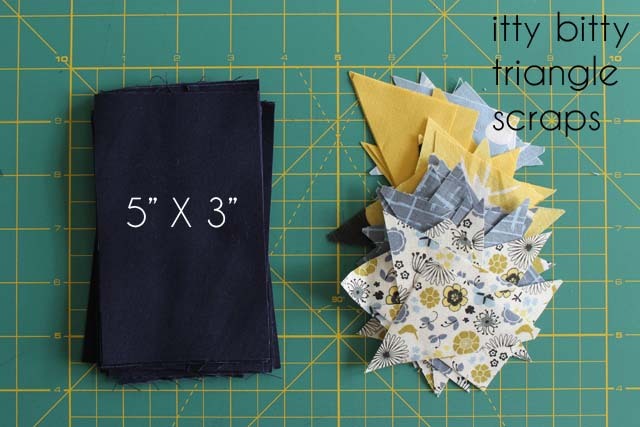 If you want to make a 12.5″ quilt block, you’ll need 9 units. 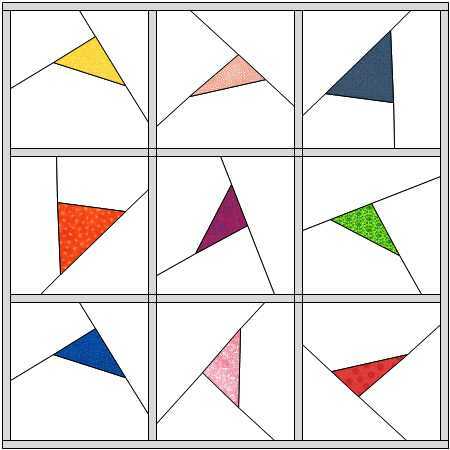 So, to start you’ll need some small triangle scraps, in a variety of angles and sizes, ranging from about 1-2″. No need to be exact with these- just use whatever you have. 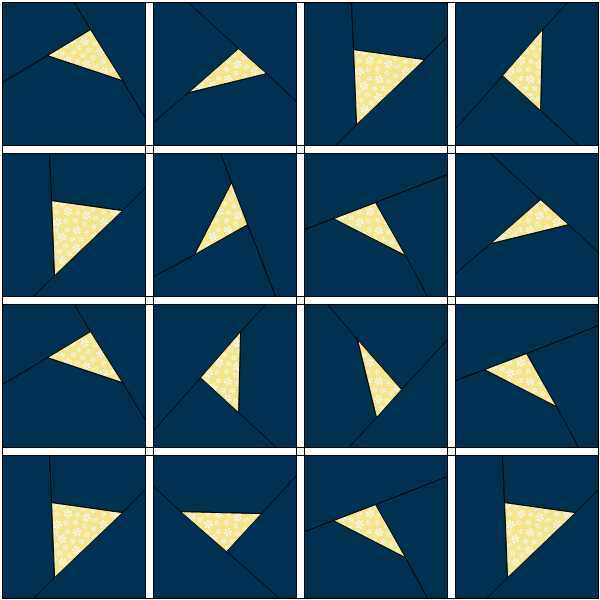 To frame each triangle, you’ll need three 3″ X 5″ rectangles of your background fabric. 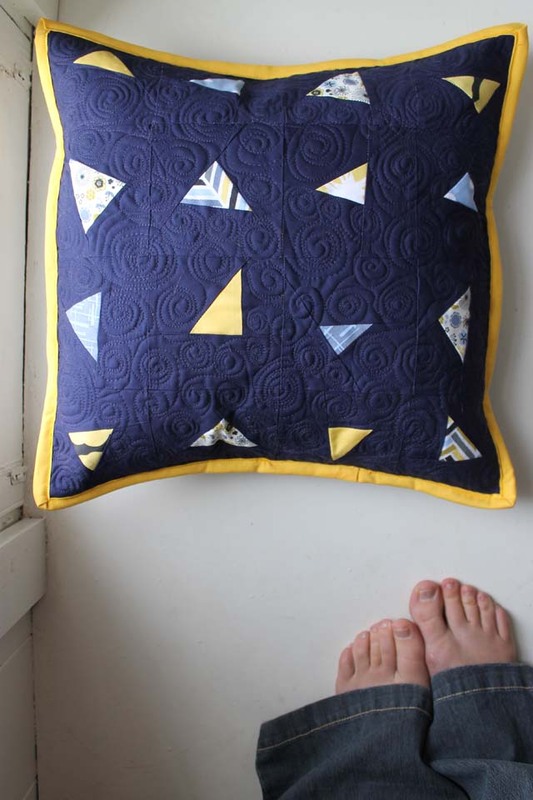 (So for this pillow, that’s 48 rectangles, and for the 12.5″ quilt block, it’s 27 rectangles). 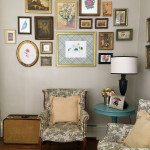 Now, center one of your triangles, right sides together, on the 5″ side of a rectangle, and stitch a quarter inch seam. In the photo you’ll notice that I started with the longest of my triangle’s sides, but this isn’t important- any side will do. Press the triangle open. 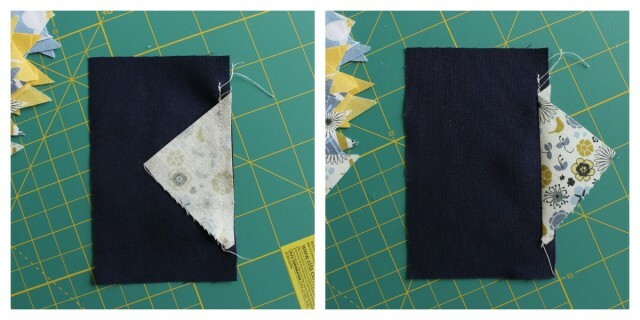 Line up your ruler with either of your remaining 2 triangle sides, and trim. 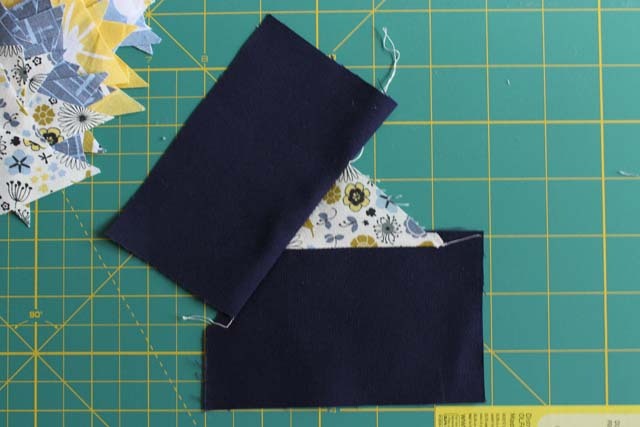 Take a second rectangle, and align it, right sides together, at that trim line, so the triangle is centered along the 5″ side, and stitch a 1/4″ seam. Press open. Now, just like you did before, align the ruler with the remaining triangle side, and trim. 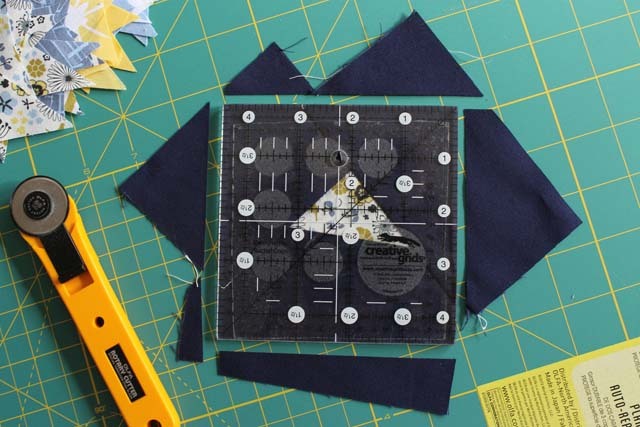 Take a third rectangle and align it, centered, on this remaining third side, right sides together, and stitch a 1/4″. Press open. Now here’s where things get wonky! 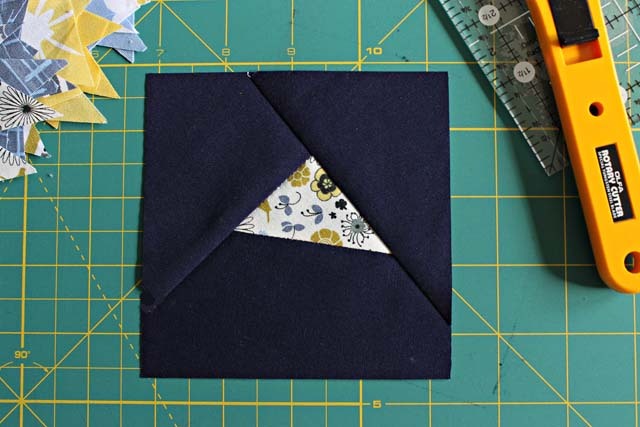 Spin your block around until you’re satisfied with the angle of your triangle, and trim to a 4.5″ square. A 4.5″ square ruler comes in super handy here. 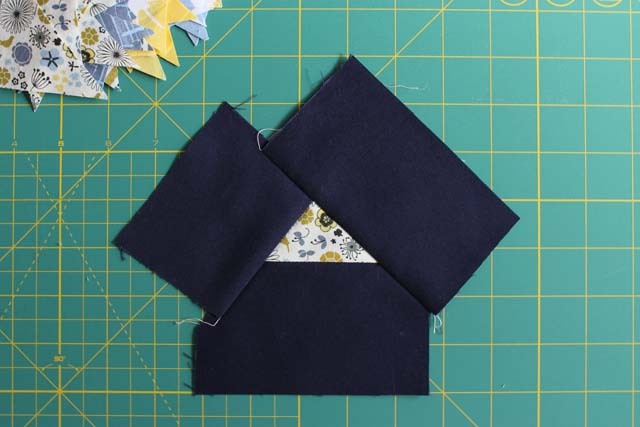 Keep in mind that the more variety you can create in terms of angles/directions of your triangles, the more “twinkly” your block will be, so don’t be afraid to get your wonk on! Here’s the layout I used for the pillow. A 4 X 4 unit layout comes to 16.5″ square, and since I like my pillows tight, a 20″ pillow form was perfect. And here it is as a 12.5″ quilt block, and with a white background color. And there you have it! Floating triangles! A really fun and easy way to use up some little scrap triangles and really make the most of them! SO CUTE!!! Thanks for sharing! 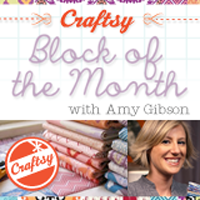 Thank you so much for the tutorial – I love the modern blocks – Looks quick and easy – I want to make one soon!! I love this. 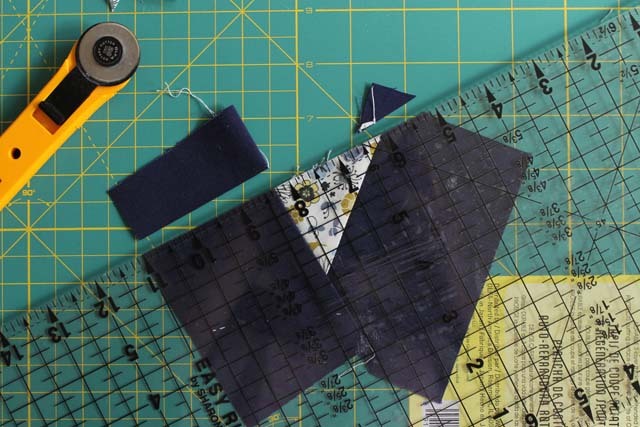 I save every scrap of fabric that I think is usable but never those triangles. Now I am going through my scrap bag to retrieve the ones I threw in there yesterday. ANd order a bolt of light grey fabric to have on hand! So neat! 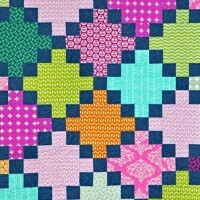 Love the colors and the quilting and the triangles. Nice work! Amy, that is adorable! Now I’m sorry I set all my Madrona Road Challenge scraps to London as a giveaway prize. Ingenious idea! Thanks for sharing. 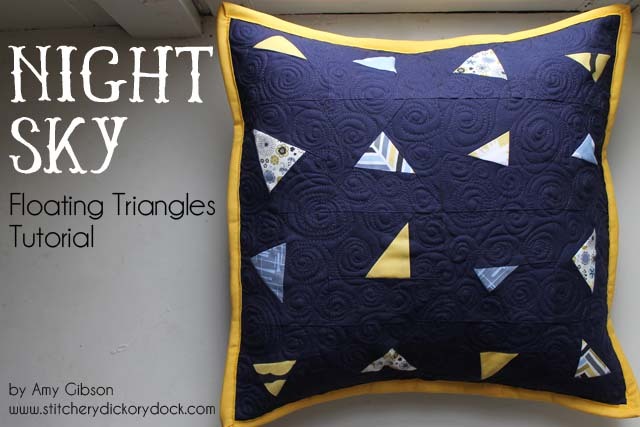 What a great use for all of those tiny triangles! I always love your posts! Keep up the good work, Amy. Oh, that is totally fun! 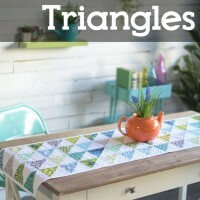 Great tutorial for those pesky triangle scraps. Really lovely cushion, Amy, I can’t wait to have a go. How are the kids doing? Surely it’s time for another post with snaps of your gorgeous offspring? 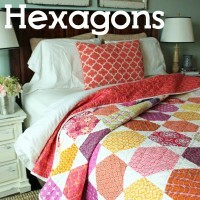 Oh I love this, the floating triangles and the colours and the quilting! Duh, why didn’t I think of that. Thanks for the tutorial. You are so creative! 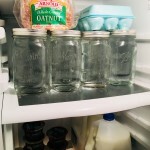 Thank you for sharing this great idea. I love it. It reminds me of sailboats in the ocean. Thanks Amy what a great use for some of the scrapes from my BOM last year! Love it. And I have plenty of triangles that I can use. Can’t wait to get started. Soooooooo Cute! Thank you so mch for the tutorial. Really looking forward to the guest post! WhooHoo! I was so excited to see your floating triangles. 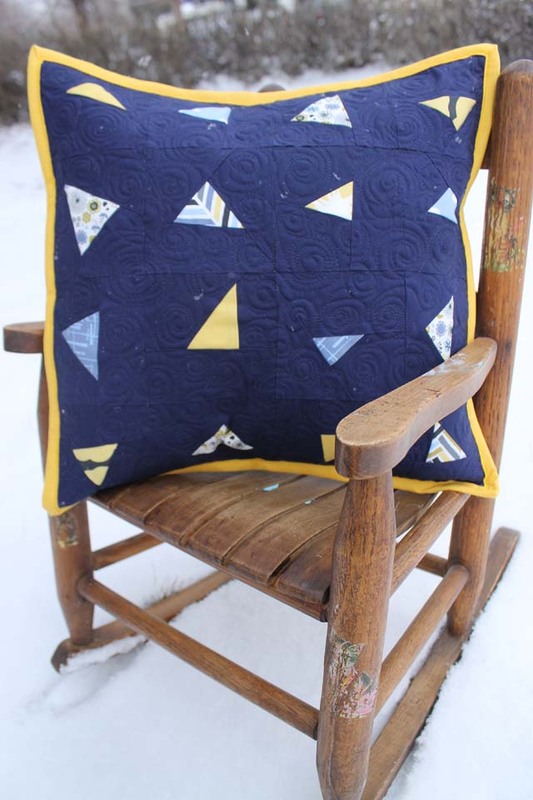 i went right to my scrap bag and made just four blocks from my Ravens fabric with purple triangles, quilted them right to some scrap batting and finished it off with a solid back. Now I have a candle rug ready for the next football season. BTW, sorry about your Broncos’ loss. Thanks for this great tutorial. I have a plastic shoebox filled with scrap triangles and have been wondering how to use them. You came through for me with this wonderful tutorial. 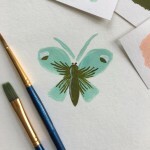 I have been looking for a creative change of pace project and this is it! 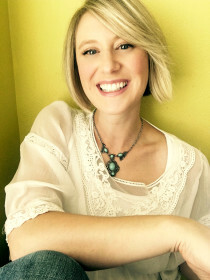 Can’t wait for the guest post…! Amy thank you….that is AWESOME! Can’t wait to give it a go…. And now you have a bunch of solid triangles to go on another color or print when you do it again! 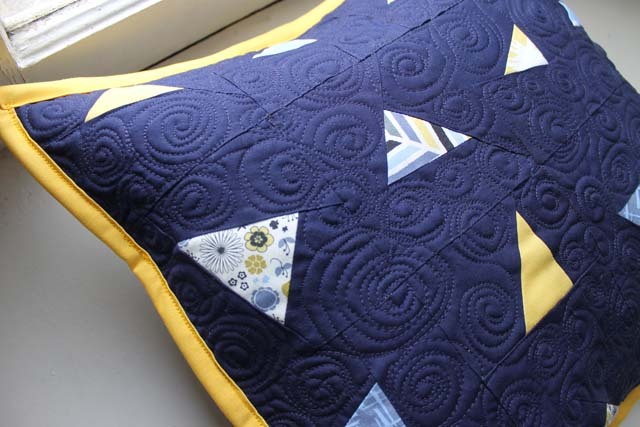 Love the swirling quilting to give those ocean bound sailors some movement. That is such a cute pillow. I think I will have to make one this week, love it! Has anyone every told you that you are amazing?! Of course they have! This is just the neatest thing . 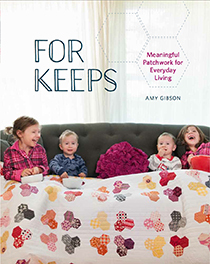 . . it’s like paper piecing, but without the paper! Thank you, can’t wait to try it. What Kathleen said….! I wouldn’t have figured it out. Delighted that it’s so easy! And I have some melt-in-your-mouth scraps from a certain B.O.M. I did last year! 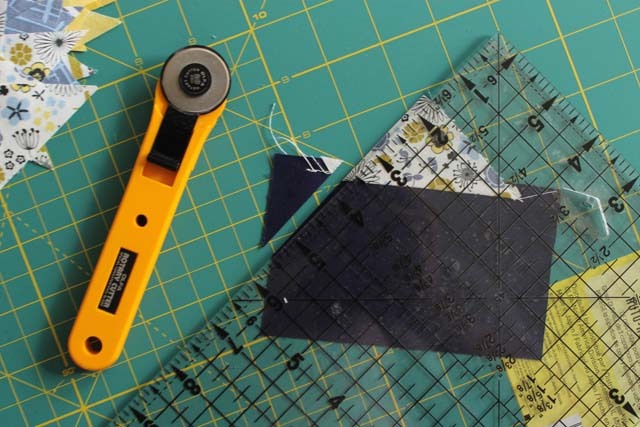 ;^D Looks like you have some dark triangle scraps to invent something with now too! 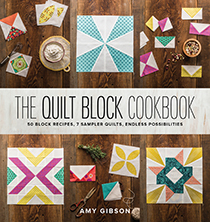 I’m hoping I can meet you at QuiltCon since I saw you mentioned being there. :-) Will you have your own booth? Do you know where you will be located? So cute…. 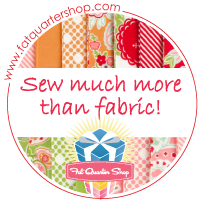 mine is ready to quilt…. (like a beginner can do, obviously ) ! Nice week-end from Europe ! Oh, love this pattern, thank you!! And I even have some Madrona road challenge leftovers to use up too! Yippee! It’s lovely. Could you please tell me what colour/kind of navy you used for the background? this is fab, can’t wait to try it out! You are brilliant with this design. I love blue & yellow. 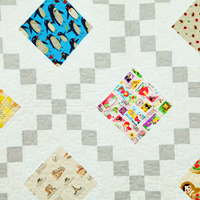 And such daring quilting. 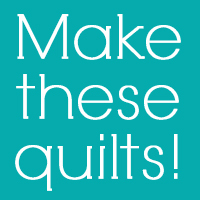 OMG this is just what I wanted to do on the quilt I’m working on – but couldn’t figure out how to do it!! Thank you for sharing! 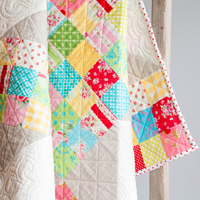 I made a quilt for my grandson and didn’t know what to do with the scraps, but now I do know…. thank you for this tut. So simple and fun. offers fabulous pearls, long chain necklaces and gorgeous rings all under $100! great deal more attention. I’ll probably be returning to read through more, thanbks for the info! accounts and answering questions about products and services from prospects. surf and sand. How to create unblockable DHTML pop-ups (no programming experience required) for FREE.